The sequence of Orgnac 3 in southern Europe is dated to MIS 9 and the beginning of MIS 8. The site contains records of Upper Acheulian occupations with evidence of Middle Palaeolithic technological strategies at the top of the sequence. In order to address the question of gradual versus punctuated changes in the onset of the Middle Palaeolithic, nine criteria on subsistence strategies and technological behaviour were selected throughout the whole stratigraphic sequence to describe behavioural patterns. Results indicate a mosaic of changes in hominin subsistence and technical behaviour and attest to both gradual and punctuated changes over time. For the most part, they cannot be explained by environmental factors such as site formation processes or climatic transitions. Thus, behavioural change at Orgnac 3 may be interpreted as ‘multifaceted,’ with a combination of gradual and punctuated shifts by hominins inhabiting the area. Orgnac 3 may be considered as a ‘key-site’ for understanding the basis of the Neanderthal material world and possibly the onset of clearly differentiated traditions in Neanderthal populations. Chronostratigraphical scheme of the sequence of Orgnac 3. Location of the stalagmitic remains from levels 6 (the stalagmitic including in level 6 grew on the top of level 7) and 5b (stalagmitic floor) and from level 2 dated back by volcanic ashes. 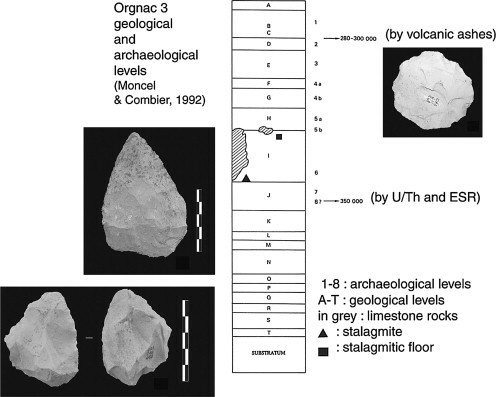 Some key artefacts characterizing the stone-tool sequence (Levallois core from level 1, biface from level 5b and centripetal core from level 6). 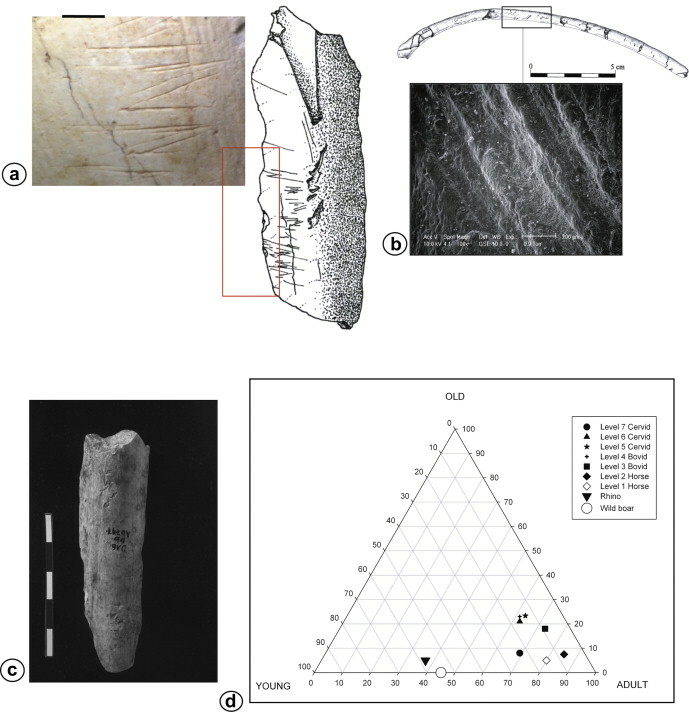 Faunal data from Orgnac 3. a) Cut marks on an Equus bone fragment (level 6), b) red deer rib (level 6), c) bone retoucher on a cervid bone fragment (level 6), d) ungulate mortality pattern for the three main prey in the sequence, compared with scavenged Rhinoceros and wild boar.